Zoho has updated its office productivity suite, adding AI capabilities and introducing a new note-taking app, Notebook. Zoho has been rolling out AI features under the Zia brand in recent years; Zia now acts as a smart assistant in Zoho's sales and customer support tools, for instance. Last week, the Chennai, India-based firm announced that Zia AI has been incorporated into its office productivity tools, too. For Zoho's word processing tool, Writer, Zia can highlight grammatical errors and style inconsistencies, provide a "readability score" for a document and suggest ways to improve writing quality. In the Zoho Show presentation software, Zia offers contextual suggestions for readability, grammar and formatting. And in Zoho Sheets, the AI assistant recommends relevant chart and pivotal tables for use and use Zia Voice - Zoho's conversational AI platform - to let users ask questions about data sets. David Smith, founder and principal analyst at InFlow Analysis, said the AI features should enhance the effectiveness of Zoho's productivity apps. "Organizations need intelligent tools that can be integrated into business processes, provide automation and increase worker efficiency and productivity across all channels," Smith said. The new AI capabilities "will bring intelligent context to streamline business workflows and processes for better efficiency." Zoho also unveiled a new Notebook app, which lets users create a variety of text, checklist, audio, photo, file and sketch note "cards." The app, which is available for free, automatically syncs to the Zoho cloud to backup data for use across devices. Other updates to the company's Office Suite apps include a "focus" mode in Writer that highlights a particular paragraph and dims everything else in the document, as well as a retro option to enable typewriter sounds when typing. Writer now works completely offline on web, mobile and iPad editions. Zoho Show users can now run presentations on Android and Apple TV-enabled devices, with a smartphone used as a controller to flick through slides. And Zoho Sheets users will be able to create their own personalized functions, such as the ability to automatically pull from an accounting app to fill in a Sheets report. Zoho faces stiff competition from Microsoft and Google, both of which have also been adding AI features to their respective productivity products. 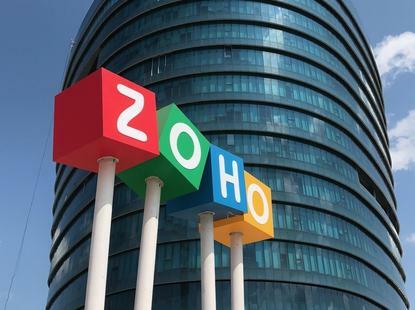 Zoho's strength lies in the breadth of its offerings, which is likely to be attractive to small- and mid-sized business in particular, said Smith. "Zoho is pushing the envelope with respect to having a full digital workplace platform that covers all business domains from sales to marketing to HR," said Smith. "That's their differentiator. This will challenge larger players like Microsoft and Google and the industry as a whole to fill gaps in their own portfolios." Zoho Office Suite is for free for individual use, $3 per user/month for small and mid-sized businesses, and $6 per user/month for enterprise customers.